I need to have more focus in my life and less chaos. I say this amid the most chaos possible. I am parenting alone for a few more weeks, planning a move, packing the house, starting a part time job, and working a full time job... You're probably exhausted just reading that. I am too! I realize that I am a casual "planner person" and I often leave one of my planners at the office but I should start using it to its full advantage. 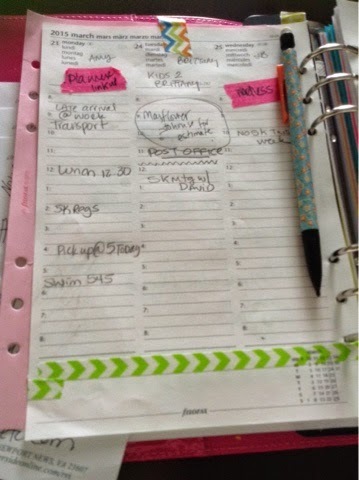 My favorite planner is of course the pink one I told you about last time. It has hourly breakdown on the days. I need to use these!! I find myself often wasting time.. If I can commit to just focusing on one thing per half hour I should surely stay on track. I want to be a more active blogger so I haves tarted planning my posts. Bright pink should be a good memory jogger!! Take a look. I'd love to hear your tips. Find me on Twitter and Instagram @alliwait. Until next time.. Happy planning! And check out the For Love of Cupcakes planner linkup!! I WAS exhausted reading that sentence! I love the washi you have on this page. :) Where do you buy yours? My main sources are Target & Michales, and occasionally Instagram. See I commented on this last week but it didn't post. Hmmm. I'll have my husband look at it...anyway, I got a bunch from "overseas" and some as gifts. I have been trying the walmart tape, it's not too bad.